Quick summary: In this activity students are asked to imagine that they have to explain the water cycle to someone who has never heard of it. They will need to think creatively about how to show the movement of water through the water cycle. Water moves naturally through our environment and our planet. We can use different ways to explain the water cycle. Learning areas addressed: Science, The Arts (Media Arts). Level of teacher scaffolding: Assist students with activity. Resources required: Printed worksheets, art materials. Homework and extension opportunities: Parts of this activity can be used as homework. The water cycle is vital to the health of humans and our environment. In this activity students are asked to imagine that they have to explain the water cycle to someone who has never heard of it. They will need to think creatively about how to show the movement of water through the water cycle. • What is the water cycle? • How does the water cycle work? • How does the environment benefit from the water cycle? • What would happen if there wasn't a water cycle? Print a copy of the activity sheet and ask them to colour it in and cut it as per the instructions. 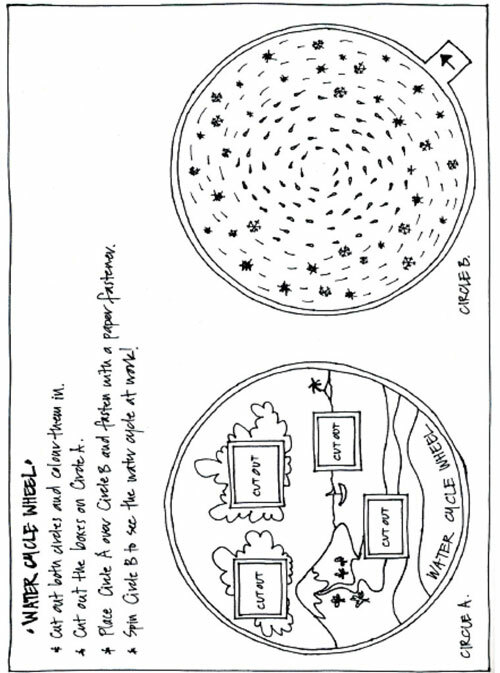 Once complete, ask students to demonstrate how the ‘Water circle wheel’ helps explain the water cycle.